When the space station astronauts warn you about a hurricane, it's time to be careful. NASA got the jump on keeping humanity safe by analyzing the possible effects of Hurricane Patricia, which made landfall on Friday before getting downgraded to a tropical storm. Using the Aqua satellite, the Suomi satellite, and the Global Precipitation Measurement core satellite, they were able to track where the hurricane would hit and with what projected force. Fortunately, the hurricane's worst wailing (an average 16 inches of rain) occurred over the Pacific Ocean, while it only accrued an average 8 inches of rain during its landfall in Mexico. "Strongest hurricane EVER!" -NASA-NOAA's Suomi NPP satellite. "That's cute." -the high-pressure star-forming region of Messier 94 galaxy. Astronauts Scott Kelly and Kjell Lindgren are preparing to make two spacewalks, the first of which will occur this Wednesday. They have spent significant time over the last week ensuring that their spacesuits are trouble-free and ready to perform the microgravity dance that is an EVA (extravehicular activity.) The first EVA, which will last six and a half hours, will have the astronauts adding a cover to the Alpha Magnetic Spectrometer (a dark matter experiment outside the station), lubing the Canadarm-2 robotic arm, and installing cables that will aid a future docking port for the station. "Did you modify my spacesuit radio to default to the David Bowie playlist?" -"Maybe I made a few little ch-ch-ch-ch-changes." Bio-science studies were, as always, of importance this week on the ISS, with Kelly, Lindgren, and cosmonaut Mikhail Kornienko undergoing exams for the Ocular Health Study. This is a critical experiment that reflects how astronauts' eyes adapt to life in microgravity. As Kelly and Kornienko have now been in space for over 200 consecutive days (with Kelly recently breaking the American record for most days spent in space in total), significant science on their long-term ocular health, vascular and central nervous systems will continue to be compiled as part of this study. Cosmonauts Sergey Volkov and Oleg Kononenko also performed cardiovascular and respiratory experiments while riding on the station's exercise bike. So much spacetime, but still sharp! 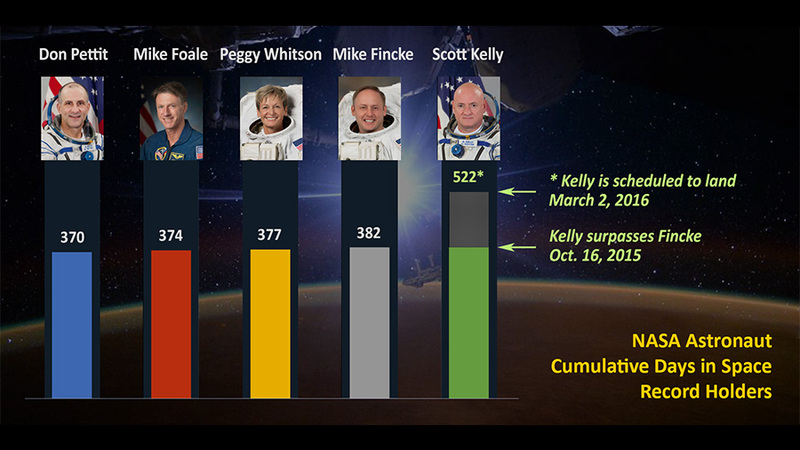 Congrats to Astronaut Kelly on his record-breaking space stay. Another interesting bit of bio-science taking place aboard the ISS is the Neuromapping study. Operating on the observations that microgravity life is more difficult for achieving tasks both physical and mental, the experiment seeks to assess how and why the human brain takes time to adapt to not inherently knowing which direction is "up." For instance, from space, humanity's rampant industrialization of its natural resources can, at times, appear beautiful. Thus, spacial memory and sensory-motor adaptation tests are undertaken to see how astronauts can reconfigure shapes when their orientation has been thoroughly messed with, as well as how effectively they can make critical decisions while remaining mobile in microgravity. All of these tests will aid future space station inhabitants, as well as pioneers on long-duration missions who might need to make these diverse dynamics their new reality. The tests may even shed light on how those with injury or illness on Earth may have had their perceptions altered, and what could be done to fix their conditions. That's all for this week, space fans! We'll see you next Sunday with reports on the American spacewalk and more news from 220 miles up. Watch this space!